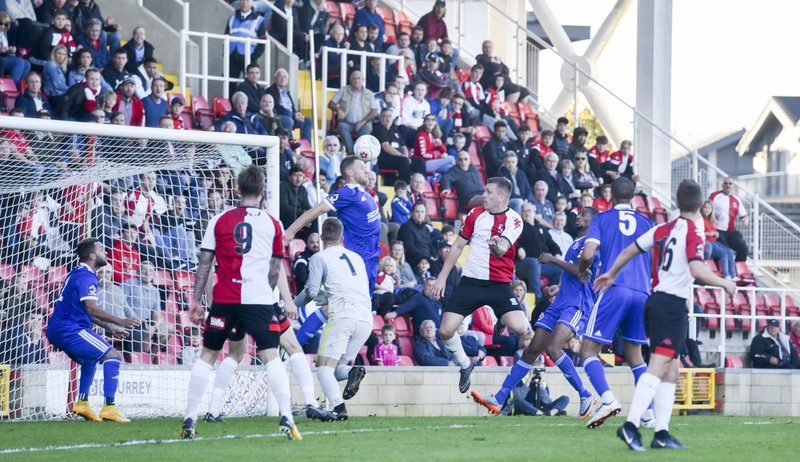 Woking progressed to the first round ‘proper’ of the FA cup after coming through a contest which swung the Cards’ way early in the second half with the dismissal of Julien Anau for a second bookable offence. With not much between the sides, Ben Gerring headed home just under 15 minutes from time to secure Woking’s place in the draw for Monday. In front of a decent sized crowd and with clear blue skies and sunshine above, you would be forgiven for thinking this was a fixture occurring at the very start of the season. Dowse, back in the dugout after a spell in the stands, opted for a couple of changes to the side which drew last week against Chelmsford. Nathan Collier and Donovan Makoma made way for Charlie Hester-Cook and Toby Edser (pictured above), making his debut for the Cards having just signed on a month's loan from Nottingham Forest. Woking kicked off facing the Kingfield Road end. The opening five minutes set the tone for what would be a tense, broken up first half, a couple of lively challenges going in from both sides right in front of the respective dug outs, bringing out the voices of the backroom staff and indicating early on that the referee might have his work cut out. Urgency and penetration lacked from both sides throughout the half, but any potential threat from Welling was often being provided by the lively, diminutive Nassim L'Ghoul, whose quick feet had found Brendan Kiernan and sizeable target man Danny Mills in good positions inside the opening ten minutes. It pushed Woking into a slightly pressured period which put Jack Cook under around the 15-minute mark, heading a ball straight up in the air just prior to giving a foul away on the edge of the box. Following a dispute over where the free kick was being taken from and the time being taken to take it, it eventually got pushed back 10 yards to the left side of the area. L'Ghoul still managed to get a shot off, and not a bad one, forcing a save from Craig Ross low to his left side. A few minutes later there was a shout from the away side for a penalty, L'Ghoul nicely flicking the ball through with a back heel, setting up a cross which went right across the six yard line, averting what looked like a coming together between defender and attacker at the back post. Approaching the half-hour mark Woking had their best spell. Jamar Loza, who had been the liveliest man for the Card's, nearly succeeded as he charged through on goal with Jake Hyde but the duo couldn't decide who would take custody of the ball and it fell away. Following a Nicky Wheeler blocked cross, Loza pick-pocketed the dozing full back Josh Hill, but the cross again blocked. Loza was then clattered by a Welling midfielder and this led to a concerning couple of minutes of treatment, but the Jamaican was able to battle on. The resulting lofted free kick led to a half-chance for Ben Gerring who couldn't make decent contact. Amongst some good endeavour getting forward by Kieran and L'Ghoul for Welling, the scrappy side of the game took hold in the lead up to half time. Julien Anau received a caution for catching Cook late, likewise Arnaud Mendy also received one for catching Loza, and L'Ghoul should have received the same punishment for a poor challenge on Wheeler in front of the dugouts. Both sides had a opportunity each to break the deadlock, L'Ghoul fed full back Craig Braham-Barratt whose cross found Mills, but his firm header went just wide of the target. In a period where Woking's long balls just were not landing, Gerring headed strongly away and found Wheeler, who delivered a superb curling through ball from the half way line, putting in Max Kretzschmar, but agonisingly he couldn't quite trap the ball. Another stoppage ensued following a clash of heads involving Hester-Cook, thankfully coming through it, and after 4 minutes of added-on time the referee ended the half. The second half began and it was clear both sides looked more determined to make something happen. Woking started brighter, good balls into the channels from Edser and Hester found Wheeler and Kretzschmar respectively, but unable to produce a final ball despite good stamina from Kretzschmar to keep his attack alive. A Wheeler cross did find Loza on the far side of the area in space, but he took too much time getting a shot off, the high effort bulging the side netting. On 55 minutes Loza made way for Paul Hodges - Dowse may have made the decision with the first half challenges in mind. A minute later, Hyde struck a fine half volley into the net, but was flagged offside. On 58 minutes the game turned in the favour of the Cards and galvanised them. Anau, cautioned in the first half, received a second yellow card for recklessly bringing down Paul Hodges who was on the charge through the middle. Minutes later Josh Casey got involved in a couple of attacks, and was unlucky not to win a penalty after appearing to be brought down in the box; he produced a good pull back ball following an overlapping run, finding Hodges on the edge of the area. His shot was brilliantly blocked by John-Paul Kissock, almost John Terry-esque with a diving header nearly making contact with the turf! Hodges followed this with great close control on the edge of the area, poking a through ball in for Hyde who could not turn round quickly enough. In the midst of the Woking momentum, the front man was cautioned on 67 minutes for dissent, remonstrating over a foul he had given away. The determination paid off on 77 minutes, a corner from the left side found Hodges whose header was nudged away by a defender, teeing up Gerring who firmly nodded home from 6 yards out among a number of bodies. Woking nearly succumbed to the old footballing cliche immediately after; a rapid break from Welling driven by L'Ghoul found Kieran, whose angled cross-shot was well saved by Ross. Woking pressed again after, searching for Hyde with a couple of through balls, the frustration coming out by way of Hester-Cook receiving a yellow card on 80 minutes for pulling the shirt of L'Ghoul, attempting to swiftly counter-attack. Both sides then made double changes, Woking bringing on Ofori-Acheampong and Luer for Hyde and Wheeler. The Cards had to do a bit of hanging on for the closing minutes, surviving a couple of penalty box melees. A dangerous corner wound up coming directly towards goal, Ross parrying away, another corner followed straight after and Kiernan powerfully headed just past the post. Ian Gayle was cautioned on 89 minutes for breaking up a Welling counter attack, the subsequent free kick landing in the box and leading to a panicky game of 'headers'. The stopper was called into one last bit of action as 5 minutes of stoppage time were confirmed, L'Ghoul finding Goldberg who struck first time from just inside the box, bringing out a fantastic reaction save from Ross to his right side. Considered a tricky test pre-match, Dowse will obviously be pleased his side came through today despite neither side being at their best. The defence showed real composure, particularly Gerring, and likewise Edser and Hester-Cook in the middle of the park. Hopefully the clinical, cutting edge side of the game will grace the Cards soon enough but today was all about getting into the draw for the next round, which we look forward to on Monday. Man of the Match: Ben Gerring. The match winner and didn’t put a foot wrong at the back for the Cards, showed great composure throughout and led well with his talking.